When making changes to webpage content, these tips will help improve the search ranking of your website. This ranking is how high up your website appears in online search results. One of the most important things you can do is to regularly update the content on the pages of your website. Recent research suggests that 25% of SEO optimisation is from the words and headings on a webpage. Google is looking for real websites with real information that people can use. It downgrades sites that use tricks such as invisible text (eg. blue text on a blue background). It is a good idea to regularly update the information on at least some of your website's pages. Making your site a source of new information helps. Any changes in the text of your webpages will be registered in the sitemap.xml file which we have associated with your website. The sitemap.xml file refreshes in the back end of your website every 24 hours. Any changes to the sitemap.xml will then be noticed by search engines, which will re-index the revised pages. Search engines reward websites for updating their content regularly with a higher search ranking, so this will help your site improve its visibility on the web. 2. You can have as many H2 or H3 headings on your page as you like. Words are marked as H2 or H3 as second only in importance to words with H1 with search engines. 3. Bolding key phrases or words also alerts search engines to the fact that this phrase is important. 4. Having other websites linking to yours also helps improve your site ranking. This can include online directories, so it's worth placing entries for your business in whatever free directories are relevant to your business. One really useful thing to do to improve your website SEO is setting up a Google Business account. This is something you need to do from your own Google+ account. There are quite a few steps involved, so we have a separate page on how to do that here. Once you have done the steps above, Google will then index your website. This is not going to happen overnight. In fact any tweaks to your website SEO, including adding metadescriptions to pages, setting up a Google business account and the registration of your sitemap.xml file will take several months to show results. Remember, there are over a billion websites and webpages out there and the largest search engine Google has indexed one quarter of them. So the activities will help Google to notice and 'crawl' your website, but this is a process that will happen over 2 to 6 months. If you need further help or more information please contact us and we will be very happy to help. 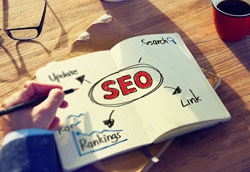 While we build in best practice for SEO when we build your website, if you are into editing updating the content going forward using a content management system (CMS), there are a few things to be aware of. Most content management systems allow access the metadata section when editing the pages on your website.